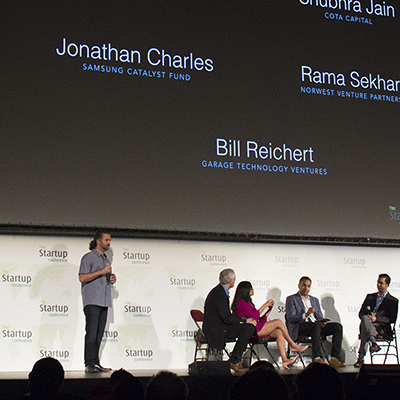 The Startup Conference bills itself as “By Founders, for Founders,” and boasts attendance of over 1,000 entrepreneurs and investors. One of the highlights of the conference is an onstage pitch contest, and this year Samsung Catalyst Fund Principal Jonathan Charles was a panelist and guest judge. The conference featured a variety of founders and investors, all of whom had inspiring and informative messages to share. The final hour featured three startups pitching to five investors, followed by the investors discussing which startup had the most compelling story. It was a fascinating opportunity to get inside the head of a venture capitalist making a funding decision. The three startups were: Hashcut, a company using AI to turn any video into a highlight real; Alysia, a program that uses AI to set a user’s words to music; and Apollo Robotics, a company that combines drones, LIDAR, and AI to automate the digital surveying of worksites. The pitches were impressive, having had the benefit of feedback sessions earlier in the day, and the investor questioning was robust. They asked not only about the product and revenue plans, but also dug in to whether the composition of the team was correct for the product offering. Shubhra Jain of Cota Capital argued strongly for the Alysia business case, noting that not only did they have a product that was capable of a variety of monetization modes, but also that female founders (in this case, Dr. Maya Ackerman, CEO of Alysia) are underrepresented in investments. Bill Reichert of Garage Technology Ventures felt that Apollo Robotics had the advantage, since they had a revenue stream lined up already, though in initial questioning, he had to probe carefully to ensure he understood the company’s unique value proposition. Jonathan Charles espoused Hashcut, who had an interesting team – in addition to including the expected AI and video expertise, their CEO is a neurosurgeon. At the final bell, Hashcut was the winner, taking home the trophy for the day. But the show’s emcee noted that he had seen over 10,000 startups, and he was sure all three companies would succeed. We certainly hope so! We had a great time at the conference, and hope you got as much out of it as we did.